Apple Macintosh IISI - $199.77 Shipped! 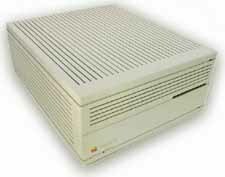 Apple Macintosh IISI features a 20 MHz 68030 processor, Minimum 5 MB of RAM, and a minimum of 40 MB hard drive in a compact desktop case. New clock battery. Mac OS 6.08 with basic applications preinstalled. Rebuilt tested floppy. Mouse, Keyboard or Monitor available extra. Thoroughly refurbished and tested as all our systems are. $199.77 Includes domestic shipping. WE ARE CURRENTLY OUT OF THIS ITEM. We do have the parts and pieces to rebuild yours! CALL!! Apple Mac IICI with OS 6.08 preinstalled along with basic utilities. Minimum 40 MB hard disk, and 5 MB RAM. The IIci has a 68030 25 mhz processor and FPU, has 3 Nubus and 1 PDS port. Rebuilt and tested Floppy Drive. Mouse, Monitor or Keyboard available separately. Thoroughly refurbished and tested as all our systems are with new battery. $199.77 includes domestic shipping! Limited quantities, send us your old one to be rebuilt. WE ARE CURRENTLY OUT OF THIS ITEM. WE DO HAVE PARTS AND PIECES TO REBUILD YOURS - CALL!! Hook a low cost LCD Monitor for your OLDER Mac! Lets face it, 17" and up LCD's can be had at bargain prices at most discount houses, and we stock a few in the older 4 by 3 ratio. Apple hasn't sold a beige CRT type monitor since 1997. Use this adapter with a low cost PC monitor or LCD with VGA output on your Mac system! Works with resolutions from 640x480 to 1600x1200. Monitor sizes from 14" to 21". Adapts Macintosh DB 15 pin video connection to PC monitor HD15(VGA) pin connection (2 row 15 pin to 3 row 15 pin). 10 pin adjustable settings w/manual. If you have a Mac II, Mac IICI, or IISI (and probably a few others of that vintage) you need to use the MODE 1 settings. 1,4,5,8 works for me on those units using my 19" Planar LCD. Style may vary from picture. Compare at up to $44.99 Our price $19.99 includes domestic shipping. If you don't have a cache card, buy one -- unless you plan to add an accelerator. The 32 KB cache card makes about a 15% difference in performance! Our used tested pulls are thoroughly checked. Our $29.99 includes domestic shipping. Getting RARE! 4 Megabytes 30 Pin SIMMS - Set of 4. Upgrade your system an additional 16MB's. Used pulled from working systems and tested. Move that old Mac II series system up to modern ram levels. Perfect upgrades for your IICI or IISI. Not sure if this fits your model? Please call and ask. These chips are no longer produced and are increasing harder to find. Our price $34.77 includes domestic shipping. Order with your system and we will install them no extra charge.